The Godwin Dri-Prime CD400M pump contributed to an impressive maximum flow level of 707,980 gallons per hour. In October 2014, construction work began on a new municipal wastewater treatment plant in Mainvilliers, a town in the Eure-et-Loir region of France, located southwest of Paris. The new wastewater treatment plant was designed to replace an existing plant located in nearby Lèves, which had been in operation since 1948. The old plant served 160,000 residents from both Mainvilliers and Lèves, as well as the surrounding municipality of Chartres. Due to aging infrastructure and increased demand, however, the plant was no longer fit for purpose. When construction work on the new wastewater treatment plant was drawing to a close in April 2017, Sade, the company supporting the construction project on the sewer, began the challenging task of connecting the existing sewer inlet at the plant in Lèves to the new station Mainvilliers. Extensive works had to be carried out on the Lèves plant’s main manifold which required the diversion of incoming wastewater to allow for the works to take place. 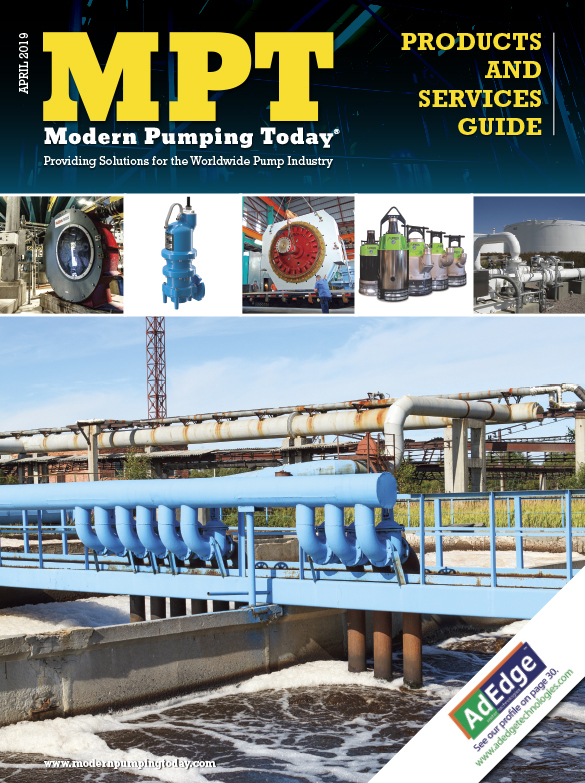 A temporary bypass pumping solution was needed to properly manage the wastewater flow and to allow the pumping station to continue to operate without disruption. Sade engaged leading global water technology company, Xylem to provide a solution, leveraging the company’s comprehensive dewatering portfolio and deep application expertise to carry out the project. Xylem deployed an expert team of engineers to work alongside Sade, delivering a customized bypass solution in record time. As the old wastewater plant at Lèves dealt with particularly high volumes of wastewater, the new bypass solution needed to withstand a maximum flow level of 707,980 gallons per hour. Flow levels at Lèves would vary day to day depending on user demands and fluctuating precipitation. For this reason, a flexible solution capable of handling flow variations and dealing with peak volumes was required. Xylem proposed a state-of-the-art, environmentally-friendly rental dewatering solution which would offer the quickest turnaround time to complete the task and be cost efficient. Leveraging the company’s strong footprint in the region, Xylem was able to deliver the complex bypass application without delay. Xylem has more than 6,000 rental assets available to European customers at nearly eighty rental sites, allowing the company to position the right fleet mix in the right location, at the right time to support customer needs with temporary and long-term rental solutions. Godwin CD225M diesel pumps played a pivotal role in this project’s success. Xylem’s dewatering engineers installed a turnkey bypass solution to maintain the sewer line, a project which was delivered in just one week while minimizing environmental impact and ensuring regulatory compliance. The team supplied two Godwin CD225M diesel pumps along with one Godwin Dri-Prime CD400M pump. The combination of diesel pumps allowed the temporary bypass to operate at maximum efficiency, offering a flexible solution for fluctuating wastewater flow levels. The pumps can handle a capacity up to 449,090 gallons per hour—giving a total combined flow of 713,260 gallons per hour across the three pumps. This flow level exceeded the maximum flow level of 707,980 gallons per hour usually experienced by the wastewater plant and ensured that the bypass had sufficient capacity to withstand varying flow levels caused by increased user activity or precipitation. The Godwin pumps were fitted with variable frequency drives (VFD), enabling operators to control the motor speed and reach the required duty point, ensuring optimum operating efficiency throughout the project. The diesel pump model used for this project also has the capacity to handle solids up to 75 millimeters in diameter, allowing small, fibrous materials to pass through the pumps impeller with ease. 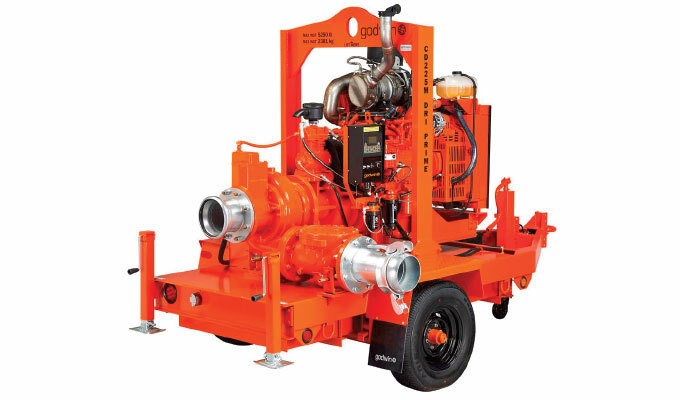 This, along with the portability of the pump, makes it an excellent choice in challenging dewatering applications where sewage, sludge, or unwanted water need to be removed or redirected. To support the bypass, Xylem supplied twelve 400-millimeter pipes, measuring 3 meters in length, to safely channel the discharge of wastewater away from a nearby river and avoid environmental damage. Xylem’s Godwin pumps were equipped with Tier 4 diesel engines which reduce air pollution by minimizing the discharge of particulate matter and nitrogen oxides in the air, as well as providing enhanced engine control and reduced noise. 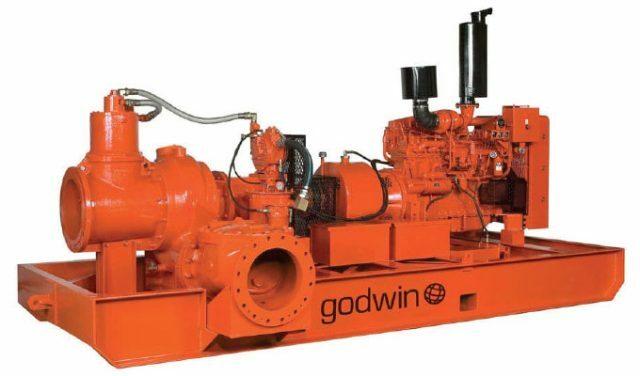 Godwin, a Xylem brand, maintains a fleet of more than 20,000 portable rental pumps and 3,200 pieces of related equipment for dewatering use in construction, mining, and quarrying; in drinking water supply; and in wastewater bypasses in municipal, industrial, and environmental markets. Its parts inventory is the largest in the industry, allowing deployment of all necessary equipment for rental, sales and service without delay. 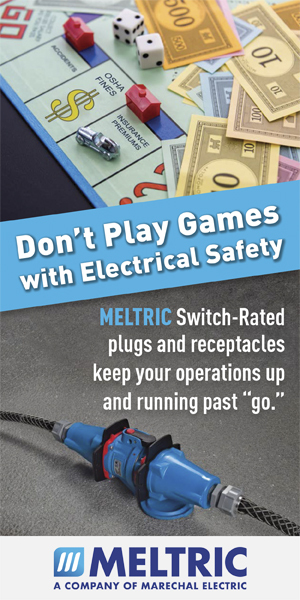 For more information, visit www.xylem.com.